St Mirren midfielder Greg Tansey has been banned for two matches following his late tackle on Hearts defender Clevid Dikamona. Tansey was booked for the high challenge during last weekend’s 1-1 draw at Tynecastle but, following a fast-track tribunal at Hampden today, his yellow card was upgraded to red for serious foul play. The 30-year-old will miss forthcoming home Premiership matches against Livingston and Kilmarnock as the bottom-placed Buddies battle to avoid the drop. 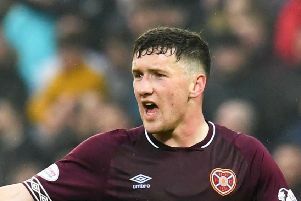 Hearts centre-back Dikamona – who was only fit enough for a place in the bench against Celtic on Wednesday night due to a thigh injury – was angered by the challenge and, when posting a video on Twitter last weekend highlighting the incident, he tagged the official SPFL account. This was pounced upon by former Hibs midfielder John McGinn, the Aston Villa and Scotland man labelling Dikamona a “grass”.